In Joshua 4, the entire nation of Israel had just finished crossing the Jordan River on dry ground. They were on the edge of the Promised Land after 40 long years of wandering in the dessert. But before they could settle into this land that God was giving them, they would face many trials, temptations and battles. 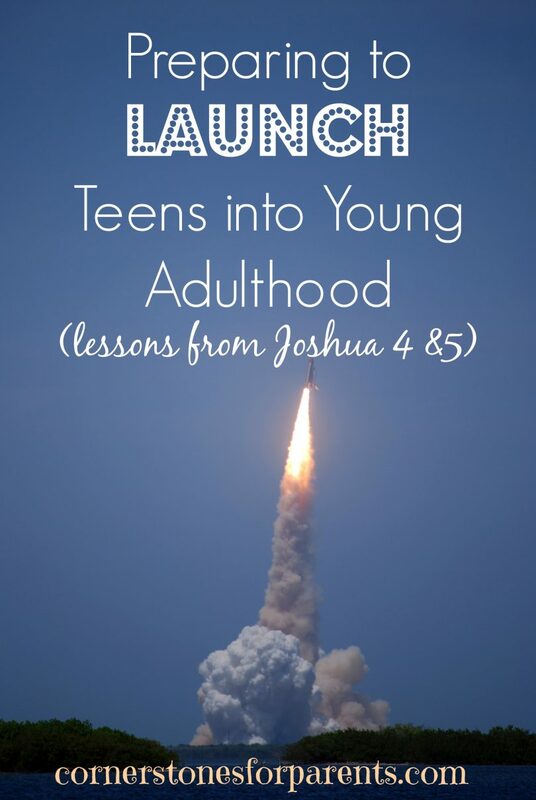 This transitional period in the history of the nation of Israel can teach us a lot about how Christian parents can successfully launch their teens into young adulthood. 1. Remember: this too shall pass. The Israelites wandered in the desert for 40 years before they could enter the Promised Land. Adolescence may not last for 40 years, but it can be helpful to remember that this stage has a distinct beginning and end. 2. Trials will happpen. The Israelites had some real struggles in the dessert as they fought between their desire to do it their way and their need to do it God’s way. Turmoil is often the hallmark of adolescence as well. As Christian parents we need to remember that it is through trials that we learn to rely on God. That is because troubles are our tether to God. 3. Stay engaged. While the Israelites wandered in the desert, God never left them. He was always near – and visibly so in the form of a pillar of cloud by day and fire by night. No matter how conflictual your relationship may become with your teen, stay connected. Eat together, watch movies together, take an interest in their passions, text them that you are praying for them. If you want your children to launch well, they will need the firm ground of a healthy relationship. If you need to repair some damage in your relationship, this article may help. 4. Remember together. In Joshua 4:5, God tells the Israelites to erect a stone memorial as a vehicle to remembering all that He did for them. And why did God want them to set up this memorial? Verse 24 has the answer: “He did this so that all the peoples of the earth might know that the hand of the Lord is powerful and so that you might always fear the Lord your God.” God wants us to remember for our sake and for the sake of others. In a previous post, we described how you and your family can create your own stone memorial to remember what God has done in your life. As teens approach young adulthood, we need to remind them of how often God has worked in their lives. This family activity is a great, tangible way to do just that. 5. Let them go, but with support. As the Israelites set out to conquer the Promised Land, God didn’t leave them, but His role changed. In chapter 5, the Israelites ate food from the land for the first time in 40 years. That very day, the manna stopped – they didn’t need it anymore. In the same way, our role and relationship with our teens will change as they transition into young adulthood. We need to prepare for and embrace this change. Let’s thank God for His word that gives us guidance and direction as we navigate this stage with our teens. Yes. Partner with our family. How might that work remotely? Great group of people all working through challenges with limited wisdow and guidance. I don’t know them personally, so I am not endorsing any of them. I would encourage you to look into them and pray for guidance. find out some tips on your website about teens parenting and is quite inspiring . Hi Victoria- so thankful it has been a help to you. Thanks for taking the time to comment.